Buy natural looking hair wigs online from one stop wigs shop DelhiHairLoss. One of the top exporters & suppliers of 100% Natural & real hair wigs in Delhi, India. We are the top manufacturer, supplier, and exporter of top quality hair wigs and hair patches. We are offering French lace hair system. French lace hair system is the perfect solution for creating an invisible hairline, which is providing us. French lace hair system is made with 100% Remy human hair. It is the finest quality of hair. You come to a right place. Our French lace hair systems is a natural looking and very breathable, keeping you comfortable no matter that what’s the weather. French lace hair systems base has shaped using a very delicate lace, If you still want a great hairline, it is a great choice. French Lace hair system can considered to be one of the lightweights. It has the most undetectable and transparent material used in hair replacement systems. It is with PU or thin skin hair systems. Entire lace base of French lace hair system tends to be comfortable when it gets in contact with your skin. 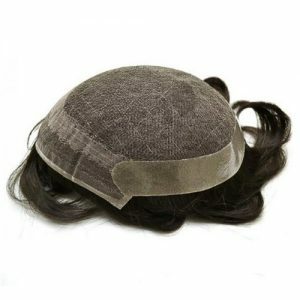 French lace hair wig creates an illusion of hair growing naturally from the scalp. It’s light in weight and easy to tape and clean.